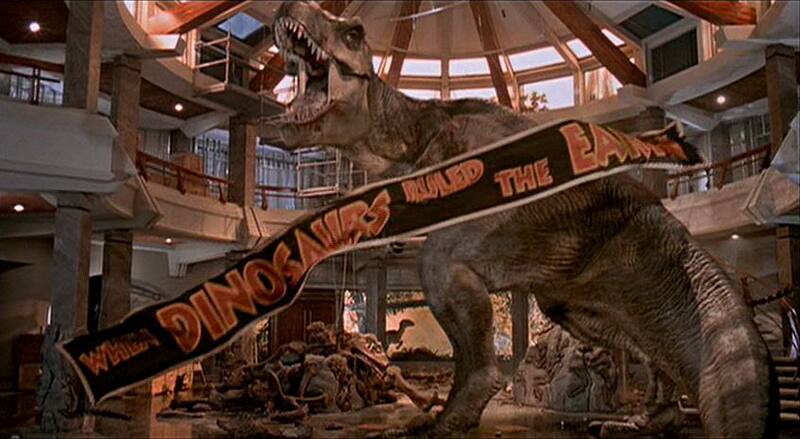 Back in 1993, this little movie called Jurassic Park came out in theaters. (That’s 20 years ago… Wow) I’m not sure when my parents deemed me old enough to watch it, but it was well after leaving theaters. After I was allowed to see it, I lived in paranoia. From then on I’m pretty sure a T-Rex stood outside my bedroom window every night. Despite the paranoia, I loved the movie and it has become a classic. Following the success of the the first movie, they decided to make 2 more with a 4th planned for June 2014. Either to promote the new movie or just to make some more money, they released the original in 3D, this past weekend. So of course I had to go see it. Now don’t get me wrong I enjoy 3D movies, but the main driving force was that I had never seen it on the big screen. Another reason was that my wife had never seen it. Never!!! Aside from making it 3D, no other changes were made to the movie. I was hoping the annoying girl would get eaten at the end, but sadly they didn’t change that either. Before I talk much about the movie, I wanted to talk briefly about 3D in movies. There are several different types of 3D movies. First you have movies that are computer animated which are rendered in 3D, via computers, think Toy Story. Secondly there are movies that are filmed using 3D cameras. The Hobbit is a perfect example of this. Thirdly there are older live action movies that are manipulated using a computer in order to add 3D effects. 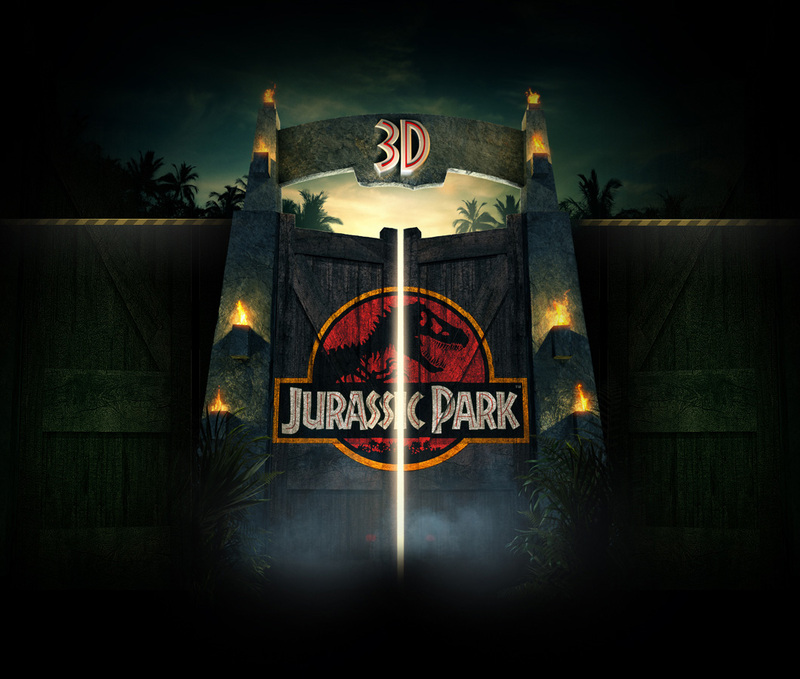 This last example is the case with Jurassic Park 3D. It was filmed in 2D and then they used computers to make it appear 3D. So how was it? Well, it was ok. Not bad, but not good. There weren’t any cheesy scenes where the T-Rex tried to come out of the screen and bite your head off (This is a good thing). All the 3D really did, was give depth to the picture. If your interested in seeing the movie just because it’s in 3D then you will probably be disappointed. As a final note the movie did look a little dated. The special effects and dinosaur animatronics still looked great, but the overall picture looked a little fuzzy. On Isla Nublar, a small island 120 miles off the coast of Costa Rica, John Hammond a billionaire decides to create a new type of theme park. A park full of real dinosaurs. The park has had some issues, so John invites a group of people to come and experience the park and hopefully give their endorsement. Dr. Alan Grant, and his assistant Ellie Sattler are paleontologists, that make their living digging up dinosaur bones and studying them. They are joined by a lawyer and Dr. Ian Malcolm a chaos theorist. The final two members of the group are John’s grandkids Lex and Tim. The last part of the tour is a safari type drive to see the live dinosaurs. This is when the excitement ramps up. Due to a combination of tropical storm/sabotage, the power to all of the electrical fences goes offline. The T-Rex breaks through the fence and attempts to eat the kids in the car. In an effort to help the kids Dr. Malcolm lights a flare and draws the T-Rex away. (It’s important to note that just before this scene the lawyer jumps out of the vehicle and hides inside a bamboo hut.) As he runs away , the bamboo hut falls apart due to the ground tremors caused by the T-Rex. Ian gets knocked down by the collapsing building and this exposes the lawyer who is sitting on the toilet. This is the best scene in the movie. The T-Rex just stares at the lawyer for a second and then in one big bite, lifts him off the toilet and into his mouth. 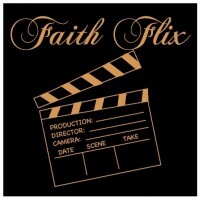 From this point on the action picks up and the movie just fly’s by. 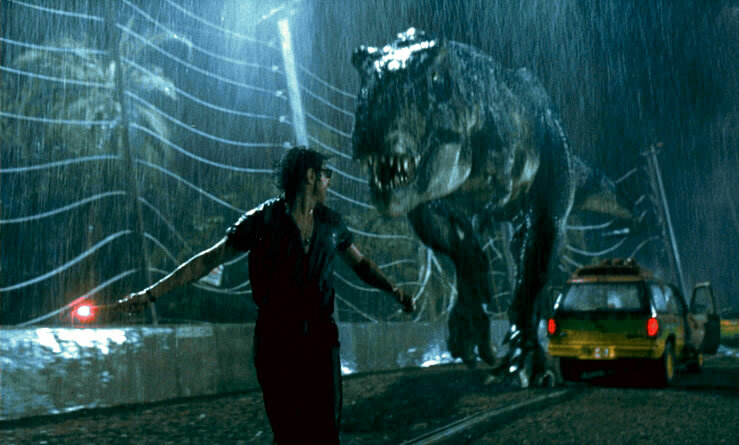 To summarize the movie, there’s a chase scene with a jeep and the T-Rex, the raptors escape from their enclosure, and finally they are able to get the power back on and meet up at the visitor center. 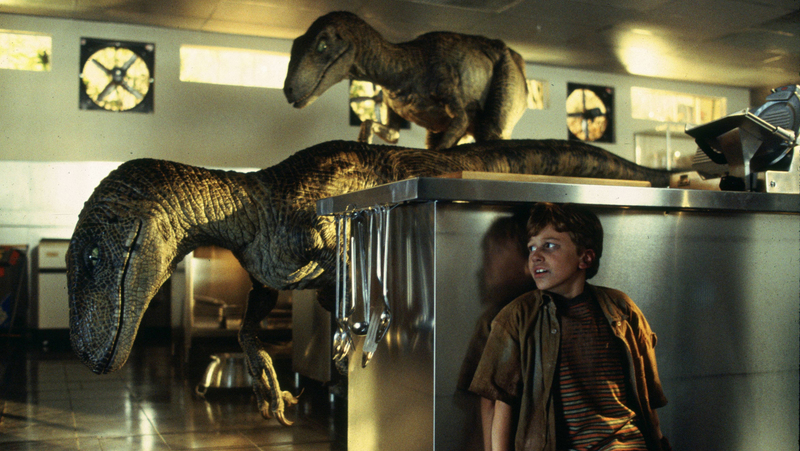 However, before they can escape the island, there’s a scene involving two raptor and the two grandkids. This is probably the scariest scene in the movie. They escape the raptors and everyone(well almost everyone) make it to the helicopter. Everyone lives happily ever after, well until the second movie. Growing up my least favorite character was Dr. Ian Malcolm, because he speaks rather negatively of the park. But as I’ve grown and matured(as much as can be expected of a male), he has become my favorite character. Besides the humor he adds to the movie, he also brings up some great moral points. During a discussion about the park, Dr. Malcolm states “Don’t you see the danger, John, inherent in what you’re doing here? Genetic power is the most awesome force the planet’s ever seen, but you wield it like a kid that’s found his dad’s gun.” After some more discussion he concludes by saying, “Yeah, yeah, but your scientists were so preoccupied with whether or not they could that they didn’t stop to think if they should.” This brings to mind the story of the Tower of Babel in Genesis 11. The people wanted to build a tower to the heavens and they thought they could do it. But God didn’t approve of their purpose/intent in building the tower, so he confused their language. We have made an incredible amount of discoveries and technological advances in the last century. As our civilization continues to advance, we need to make sure we don’t let it get to our heads or abuse the power we have been granted. In the words of Uncle Ben, “With great power comes great responsibility”. Just because we have the power to do something doesn’t mean that we should. Another main point that he brings up is the chaos theory, don’t worry I’m not going to detail about that. But the gist of it is that even if we think we are in control, we really aren’t. 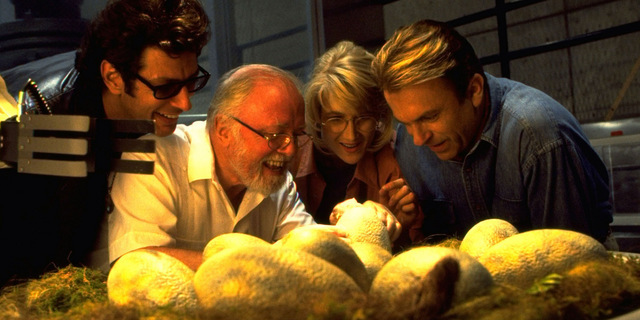 John Hammond believed that the park was perfectly safe and under his control, but in the end Malcolm was right. Often times we want to be in control of what happens in our lives, but all to often we find out that we have no control. God is the only one who is truly in control and we must trust in Him. So in conclusion, I think this is a great action movie. It has a little bit of everything in it: humor, suspense a chase scene, and best of all giant dinosaurs! The music, which was written by John Williams, is great throughout the movie. If your going just to see the 3D effects, then don’t waste your money. But if you love the movie and just want to see it on the big screen then it is totally worth it. My least favorite part of the movie is Lex’s character, she screams/whines throughout and by the end you start hoping she will get eaten. Despite being an action movie, Jurassic Park brings up some thought provoking ideas. Just because you have the power to do something doesn’t mean you should and who is really in control? Now go out and watch this movie!!! Dr. Ian Malcolm: [as they escape the T-Rex chasing after them in the Jeep] You think they’ll have that on the tour? Lex: He’s gonna eat the goat? Donald Gennaro: What’s the matter, kid? You never had lamb chops? Dr. Ian Malcolm: Gee, the lack of humility before nature that’s being displayed here, uh… staggers me. Dr. Ian Malcolm: Yeah, I know. They’re a lot worse. John Hammond: No, no, Donald, Donald, Donald… let him talk. There’s no reason… I want to hear every viewpoint, I really do. Good review. Loved the comment on ‘control’ and the Chaos Theory, personally. I think a lot of wrong happens in our lives simply because we cling to the illusion of control. Another good movie that makes this point is Instinct (Anthony Hopkins, Cuba Gooding) – a good watch. Thanks! It wasn’t until watching it this last time that I caught on to the ideas of control and chaos. I’ve never seen Instinct, might have to check it out now. Thanks for the suggestion. Yeah that’s a great scene. Thanks for sharing the clip! Good review Elliott. Some of it may feel dumb, but it’s still always fun, exciting, and a blast to watch, no matter how old you get. Thanks! I know what you mean. Every time they showed a computer, I just shook my head. I know my kids(once I have some) will probably think it’s incredibly cheesy. But I will still make them watch it and tell them how awesome it is!